Unlike a conventional computer game, DigiWall lets you move freely without being tied to a monitor. The gaming experience is based on a balance of visual and aural feedback and body movements. Games, contests, challenges and various kinds of creative experiences and experiments are all possible with the DigiWall climbing wall. DigiWall has hand- and foot grips with built-in sensors and lights. In addition to this the wall has a high end surround sound system. Using this interface, a large number of totally different games, exercises, challenges and aesthetic experiences are created. 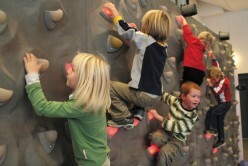 On DigiWall, you can do creative exercises based on varying degrees of physical activity. Sound and music are integral and are used to create the gaming experience and give instructions and feedback. This enables unique experiences that encourage play. When not in use, DigiWall lives its own life and becomes a beautiful sound and light installation. An entertaining work of art – to watch, listen to and touch – and above all, to interact with.